CATHAYGRAN HIGHEST QUALITY INORGANIC MICRO-GRANULATED PIGMENTS FOR CONSTRUCTION APPLICATIONS ™ Global Technology Applied for Local Solutions USA Based Technical Support Laboratory Locally Stocked for Rapid Availability FOR THE AMERICAN CONCRETE INDUSTRY COLORING THE GLOBE WITH SYNTHETIC IRON OXIDE PIGMENTS Since 1979, a world leader in production technologies and the manufacture of pigments for the construction industry, sophisticated products for coatings systems, and high quality purity iron oxides for cosmetics. Cathay Customer Service - please call 855-4CATHAY (855-422-8429) www.cathayindusa.com S FOR CONSTRUCTION APPLICA TION S STATE OF THE ART TECHNOLOGY A new generation of spray-drying technology for inorganic micro-granulated pigments for USA concrete producers. DEVELOPED FOR AUTOMATIC DOSING SYSTEMS Excellent fl ow properties allow use on all major automatic-dosing systems present in the marketplace. Also easy to dose manually. 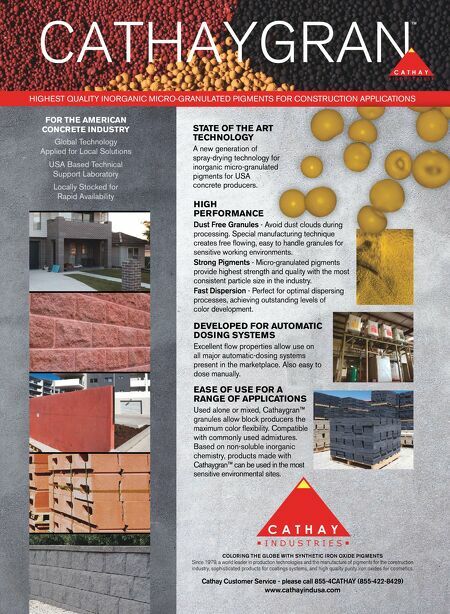 EASE OF USE FOR A RANGE OF APPLICATIONS Used alone or mixed, Cathaygran™ granules allow block producers the maximum color fl exibility. 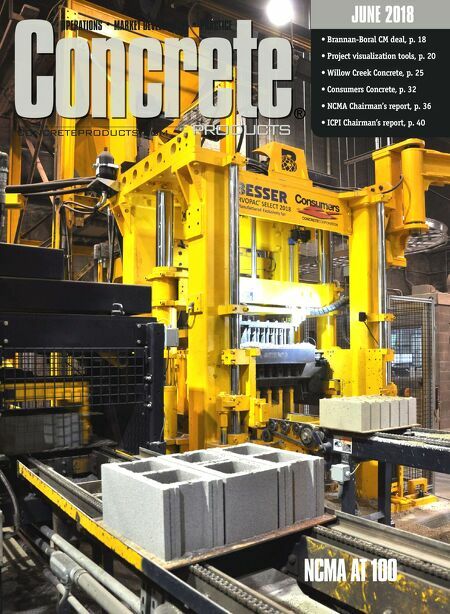 Compatible with commonly used admixtures. Based on non-soluble inorganic chemistry, products made with Cathaygran™ can be used in the most sensitive environmental sites. HIGH PERFORMANCE Dust Free Granules - Avoid dust clouds during processing. Special manufacturing technique creates free fl owing, easy to handle granules for sensitive working environments. Strong Pigments - Micro-granulated pigments provide highest strength and quality with the most consistent particle size in the industry. Fast Dispersion - Perfect for optimal dispersing processes, achieving outstanding levels of color development.